Hampi, small little town in the northern Karnataka was once a seat of the mighty Vijayanagara Empire. It is distinct with its tombs, fallen places, beautifully made temples, ancient monuments and arches everywhere, aged with time but still with its charisma intact. 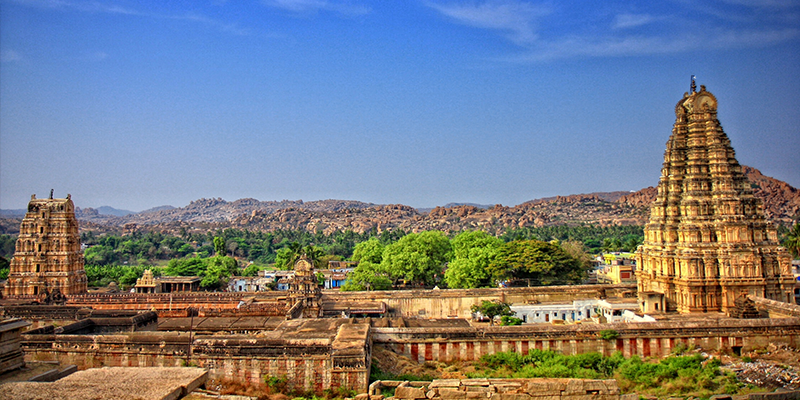 Hampi bears a testimony to a rich and wealthy land that was looted and plundered by invaders from across the globe. While for some it is the stark beauty of igneous rock formations that dominate the landscape, for many others it is about experiencing a different sense of time, a disconnection from the hustle and bustle of modern India. According to the mythological epic Ramayana, Lord Rama, and his brother had visited this place while looking for Sita. While the ruins of Hampi are a UNESCO World Heritage site, the Hampi Monuments, popular for their carvings date back to the 14th Century. 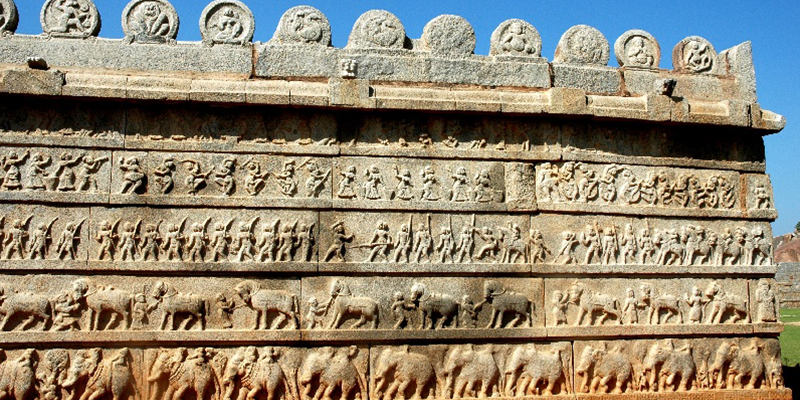 Hampi is surrounded by exquisite ruins of the ancient Vijayanagara kingdom. The intricate carvings tell tales of fallen kings and charming queens, tenants and peasants who belonged to the land, men and women, their love, ‘Devdasis’. 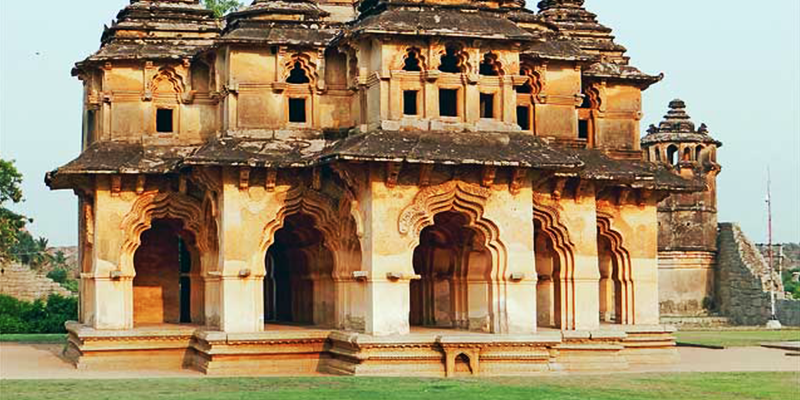 Comprising of over 500 historic structures, the best part of Hampi is that it surprise you find at every turn. Vithala Temple Complex – Built in the 16th century, the Vithala temple is dedicated to Lord Vishnu. Many successive kings have enhanced the temple campus during their regimes to the present form. One can even see the remains of a township called Vithalapura that existed around this temple complex. The highlight of Vithala temple is its impressive pillared halls and the stone chariot. The halls are carved with an array of sculptures on the giant granite pillars. 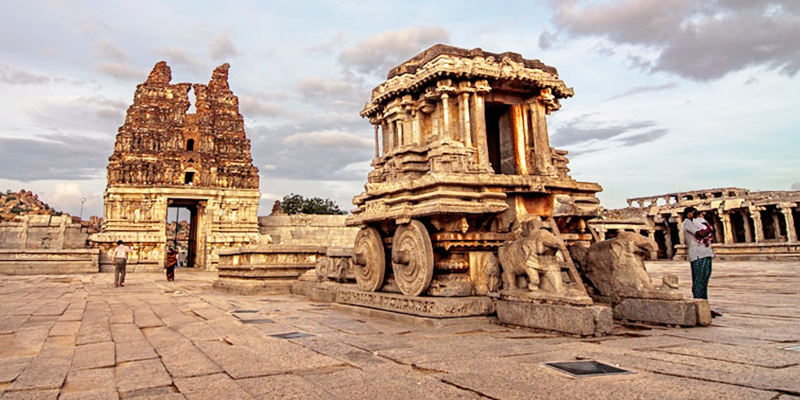 The stone chariot located inside the campus is one of the iconic structures of Hampi. Its main attraction is the music pillars that emanate music when tapped. Virupaksha Temple – Located on the south bank of the river Tungabadra, this temple has been an important pilgrimage center for the worshipers of lord Shiva. The very origin of Hampi’ s history as a sacred place revolves around the myths associated with this temple. 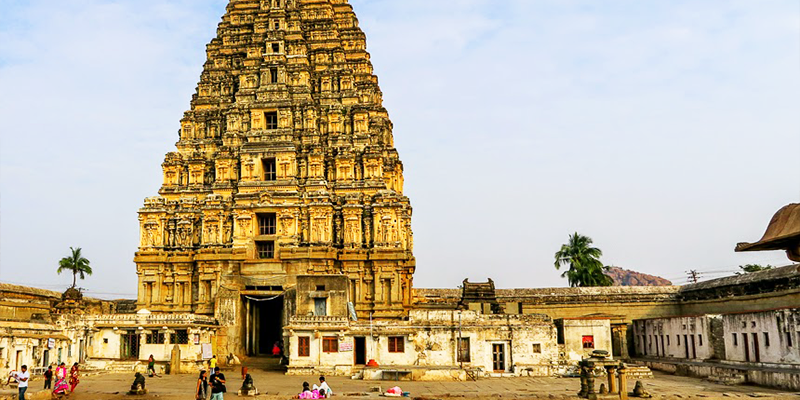 It is known as the oldest temple in Hampi and ever since its foundation in 7th century A.D, this temple is known to have been functioning without any interruption. Its entrance is via the very popular Hampi Bazaar. The Story behind – It is believed that Parvati was born in this region as Pampa. She wanted to marry Lord Shiva, who was deep in meditation on the Hemakuta hill, which is right opposite the present temple. She realized that meditation was the only way she could win him, and proceeded to do so. Finally, Shiva became aware of her and agreed to marry her. The location where they were married is where the Virupaksha temple stands today. Hazara Rama Temple Complex – Once the private temple of kings and the royal families of the Vijayanagara Empire, this important shrine in Hampi is dedicated to Lord Rama. Hazara Rama temple was built in the early part of 15th century by the then king of Vijayanagara, Devaraya II. This ruined temple complex is well known for elaborate frescoes from the Hindu religion and a sprawling courtyard well-laid with gardens. It is well known for more than thousand carvings & inscriptions on & in the temple depicting the mighty story of Ramayana, thus sticking true to its name ‘Hazara Rama’. The Lotus Mahal – This majestic structure is part of the Zenana Enclosure, a secluded area which was used to be reserved for the royal ladies of the Vijayanagara Empire. It is one of the few amazing structures of Hampi that were left undamaged during the siege of the city. Gejjala Mantapa – Located at a short distance from the famous Vithala Temple, Gajjala Mantapa is one of the most ornately decorated structures found in the ruins of Hampi. 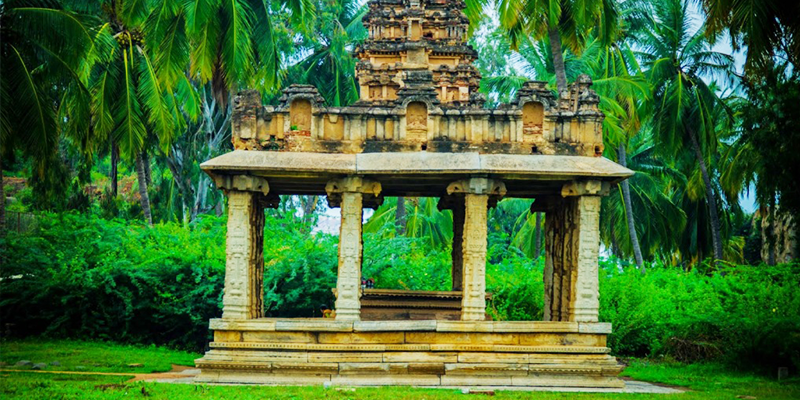 While the origin of the Mantapa dates back to 500 years ago, it is believed that this temple was used to keep statues and idols of Gods during the annual temple festival of Vijayanagara that was prevalent in that era. While some locals believe that many music and dance festivals were conducted there in the ancient times. These were just a few of the grandeurs of Hampi, a place so larger than life. Though in ruins, Hampi is truly a town of simplicity and grandeur. It is a place where anyone can find the richness of spiritual unity in the heart of the town. Travel Tip – Nearest railhead from Hampi is Hospet which is 13 km away from the town. You can hire a taxi or cab to reach the place. Its about only see with heart & mind a memorable heartly feeling it only . Thank you very much for giving many wonderful information about Hampi. You are doing wonderful service to people like us to crave for information about our country. Thank you for posting such information connected with railways. Very informative and interesting. Keep it up. Thanks for sending wonderful information. If possible please give more about the places and how to reach by train. As for Hampi, nearest railhead from this destination is Hospet which is 13 km away from the town. You can hire a taxi or cab from there to reach the place. Keep reading our blogs and keep sending the wonderful feedbacks.